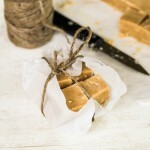 Anya and her daughter Masha are the writer/photographer team behind the popular blog Golubka, and they’ve managed to translate the same helpful and friendly tone and gorgeous photography that have mad their blog a success into this cookbook. The Vibrant Table will inspire you for every meal of the day, with as many healthy breakfast recipes and snacks as savory lunch and dinner ideas. Since I’m a bit of a Russophile, the dishes with a strong Russian influence hold special appeal to me, and I loved getting glimpses of Anya’s memories into summer days at their dacha, foraging for mushrooms and berries. Most of the recipes require a medium effort level: they’re not extremely simple, nor are they overly complex. There also aren’t too may “out there” ingredients (by which I mean the dairy and meat replacements and weird alternative powders that some vegetarian/vegan recipes rely so heavily on, and really turn me off as an omnivore). Instead, the focus is on whole foods and natural flavors you’ll be able to find fairly easily. 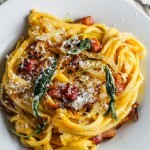 True to the title, the food really is vibrant, and I love that the photography, which is light-filled and richly colored, compliments the bright and healthy feel of the food so gorgeously. 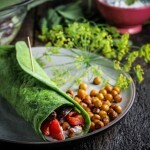 The Food: I cooked dinner from this book the same day it arrived in the mail – I was so inspired by it that I went out to the store just so I could make the Chickpea Crepes with Mango Salsa that night. I later adapted that recipe to have more Indian flavors and served it with grilled curried chicken (recipe here! ), and I’m sure it’s one of many recipes inspired by this book that will enter my regular dinner rotation. 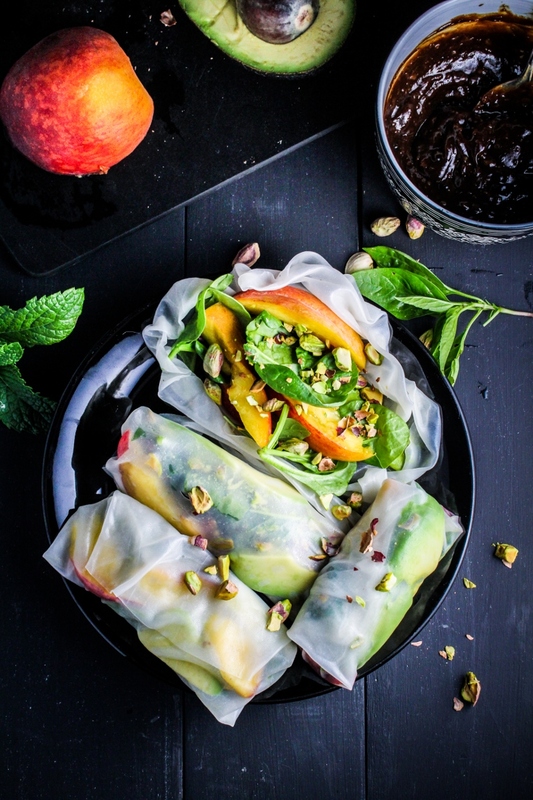 For this post, I’m sticking to a recipe that I didn’t feel the need to adapt in the slightest – these beautiful, refreshing Peach and Avocado Summer Rolls. 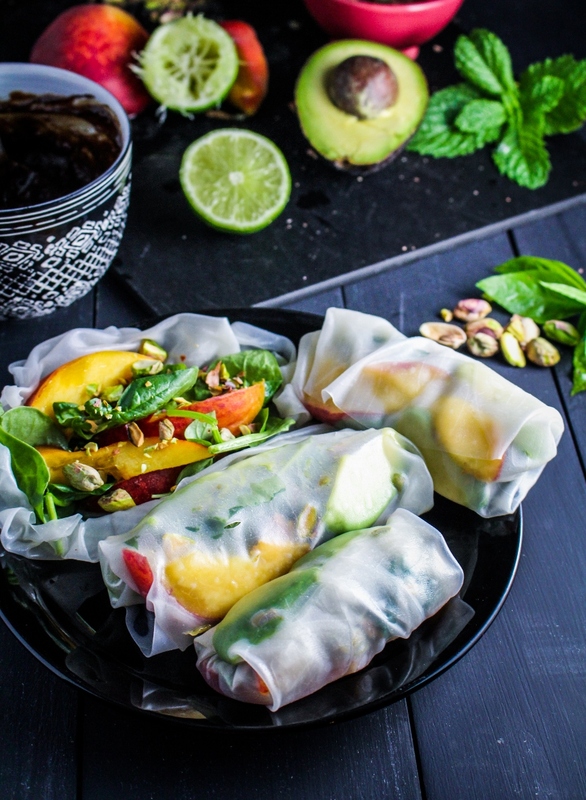 These summer rolls are packed with an astounding number of bright, juicy flavors. 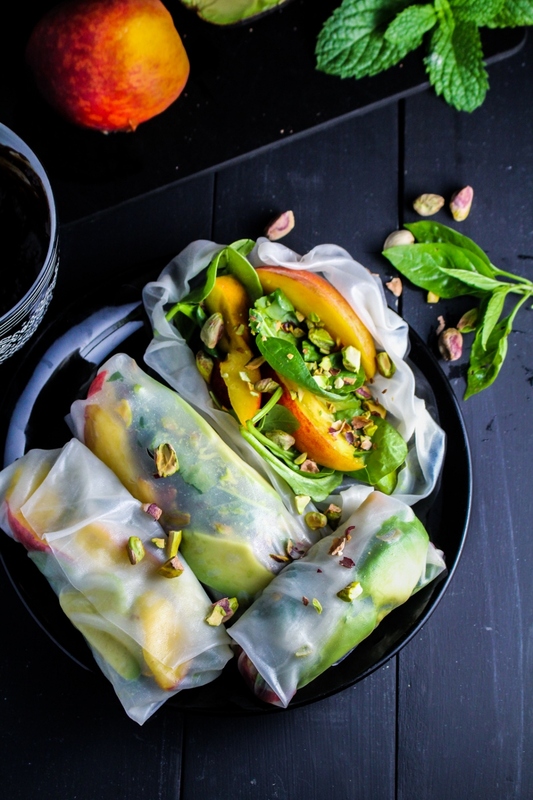 Even though they’re one of the main ingredients, the peaches feel unexpected with each bite, when gorgeous little bursts of peach juice mix with the creamy avocado and toothy rice paper. The sauce, too, is intense and delicious, with both the sourness of the tamarind and the saltiness of the soy making it mildly addictive. 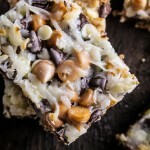 I will certainly be making these again – they make a filling summer dinner that’s not heavy in the slightest – but I’ll definitely need to practice my wrapping technique (i.e. please excuse the messy styling in these pictures). 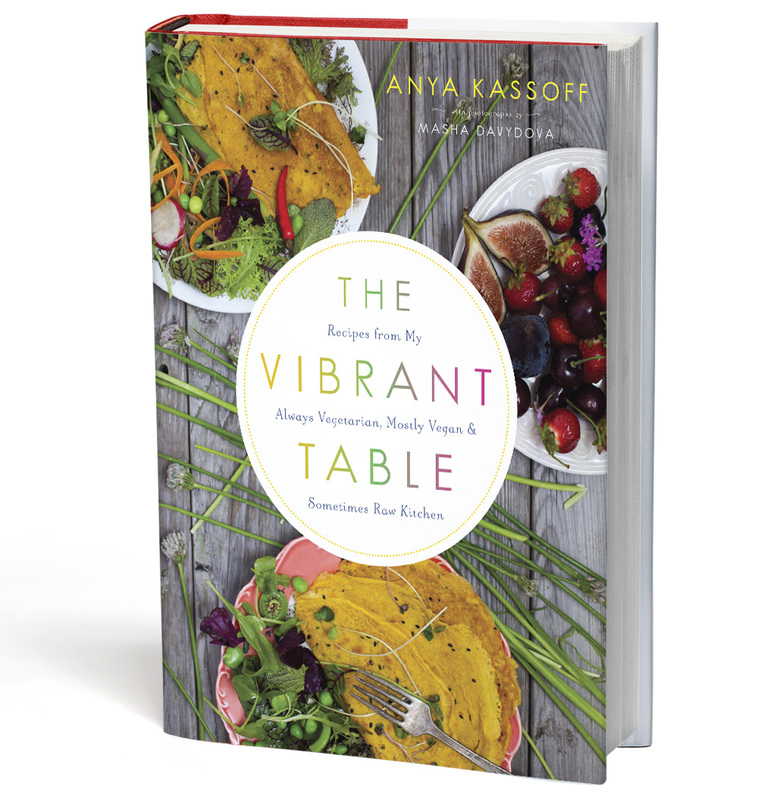 Disclaimer: I received a review copy of The Vibrant Table from Roost Books, but I was not otherwise compensated and all thought and opinions are my own. Recipe from The Vibrant Table. Makes 15 rolls. To make the sauce, whisk together the almond butter, tamarind paste, maple syrup, ginger, and soy sauce until smooth. You may need to increase the amount of soy to get a thinner sauce if using very thick almond butter. Taste, and adjust balance if necessary. Place the avocado slices in a shallow dish and squeeze the lime juice over them. In a small bowl, mix the pistachios with 1 tsp of the hazelnut oil and a pinch of sea salt (only if using unsalted pistachios) and set aside. In a large bowl, combine the spinach leaves with the remaining 1 TBS of hazelnut oil and toss gently with your hands to coat the spinach. Fill a large flat dish (such as a pie plate) with slightly warm water. Soak the rice paper wrappers in the warm water one at a time, submerging each wrapper evenly and soaking until soft. As you remove each wrapper from the water, fill it immediately: place 1-2 peach slices in the middle, top with 2-3 avocado slices, a handful of spinach leaves, a few basil or mint leaves, and a small spoonful of pistachios, followed by 1 more peach slice. Don’t overfill the wrapper, as it will be difficult to roll. To roll it, fold the bottoms of the wrapper up over the filling on both sides, then roll to close. Repeat until all your filling is used. Serve immediately with the dipping sauce. Honest and informative review! 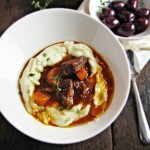 The recipe you chose has amazing flavors in it, so great choice & truly vibrantly colored photos! This is Amazing, what’s the cover for this roll? Peaches in a sumer roll? SUCH a brilliant idea! This sounds like the most refreshing snack for a long summer afternoon. 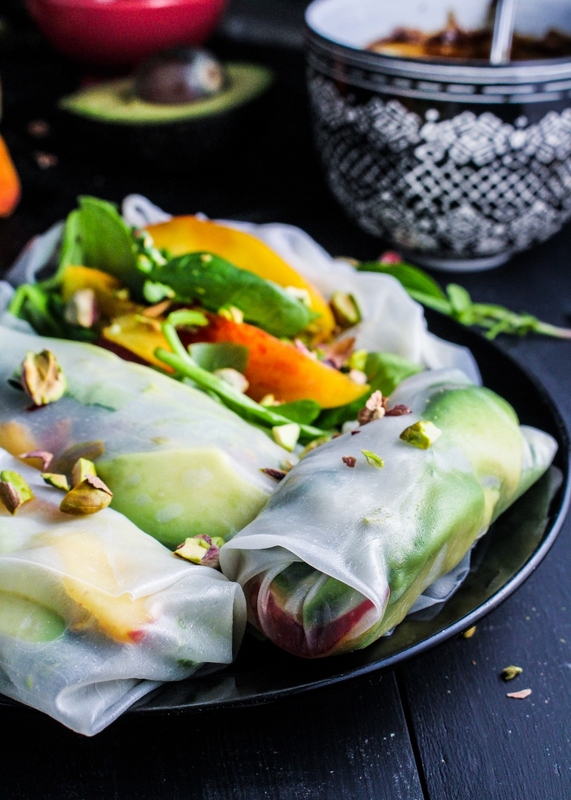 summer rolls are my latest food obsession and this version looks gorgeous and delicious! I will be making this very soon. 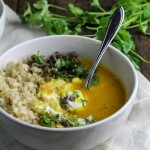 I recently posted a version with tofu, avocado, mango and mint with a creamy miso cashew dipping sauce, so yummy, if you like you can find it at http://www.sweetgreenkitchen.com. This is an awesome combination of ingredients, i was more intrigued how you are able to make mango salsa i never thought of turning it into that, great post. Thank you, Anya! And thank you also for putting together such an inspiring book, which is going to make it that much easier to keep eating healthy.